"Medical staff are incompetent and deserve to be cut with a knife" - that's the opinion of TV personality Wang Mudi who is described as a Guangdong TV finance news presenter and producer. 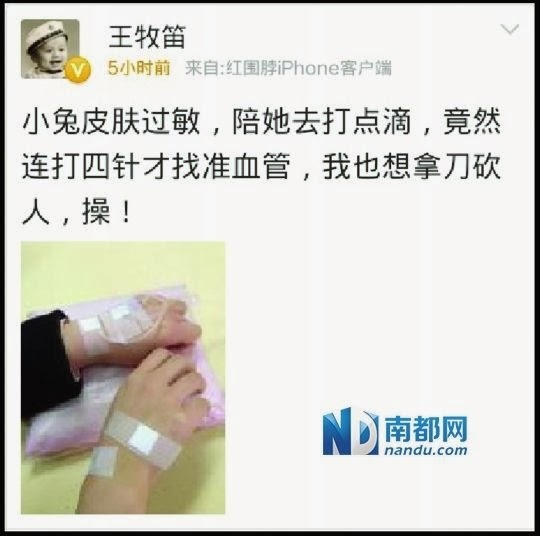 He made the remarks on Weibo after he took his girlfriend to a hospital to have treatment for a skin allergy. Mr Wang took his "Little Bunny" to have an IV 'infusion' (the Chinese cure for everything - oral drugs are seen as inferior) for the rash on her hands. Unfortunately, the nurse at the hospital took four attempts to find a suitable vein for the IV line, causing the girlfriend much pain and distress. Wang complained online to his 370,000 followers about the nurse's insolent attitude and said he would like to chop someone with a knife. His remarks drew a lot of negative feedback online in light of recent attacks on medical staff - including he killing this month of an ENT surgeon in Heilonjiang. Wang later apologised on Weibo and tried to justify his remarks by saying the nurse had been chatting away to someone else and didn't seem to care - and didn't apologise either. However, doctors and nurses said Wang's remarks encouraged attacks on medical staff and he wasn't fit to be on TV. Following on from my post about red envelopes and the culture of bribery and connections in Chinese medicine yesterday, the business magazine Caixin has a timely feature on China's "special care patients" - a euphemism for super rich. The article describes how most hospitals have a special wing for the wealthy, in which money can buy you a luxury private room complete with big-screen TV, plump cushions and an attentive nurse - and of course attended by the top surgeons. The VIP medical suites are thriving and they are one of the main ways that public hospitals can make money. A State Council decree in 2009 ordered them to take up no more than 10% of a hospital's beds, but critics say the VIP sections of hospitals are unlikely to be cut back. Caixin quotes Xu Shuo, deputy chairman of the Chinese Medical Doctor Association, as saying the suites are a symbol of the growing wealth inequality in China and will eventually have to close - or become a bridge between public and private medicine. However, critics say the private wings are simply too lucrative for both the hospitals and the doctors who work in them to disappear. Mianyang's Corridor Doctor whistleblower Lan Yuefeng is featured in ChinaSmack. The site provides some pictures of the strike and public protest by her former colleagues who objected to her criticisms of the hospital from which she was sacked. Interesting comments from Chinese netizens and also western readers, most of whom side with the 'whistleblower', even though the staff say she is an attention seeker. Meanwhile, the smog continues in Beijing - and a story in the local news says that a Tsinghua University research team has found more than 1,300 species of microbes in it. Most of the bugs are harmless, but a small number are pathogens, according to the report. And in Guangzhou, authorities are to announce new rules to deal with the "malicious abandonment" of babies after a dead baby was left outside a recently constructed "baby hatch" in the city, it is reported. The baby hatch was set up by authorities to accept abandoned infants. An autopsy will be carried out on the dead baby and if it is found to have had disease, the parents could be accused of intentional homicide, police say.